"Pacemaker companies set standards for magnetic and electromagnetic thresholds for pacemakers. 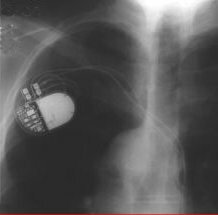 We have investigated the problems with high electrostatic discharges and pacemaker patients in the workplace." Many companies require that a survey of the workplace be performed before an employee who has had a pacemaker implanted can come back to work. This survey usually only looks at the magnetic (static and dynamic) fields and at the electromagnetic fields from low frequencies to high frequencies. The chart shows one pacemaker compay's limits for the workplace of a pacemaker patient. 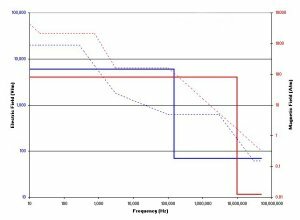 Fowler Associates not only performs the normal magnetic/EMI surveys, we also look at the problem of electrostatic discharges (ESD) to the patient. Normally, ESD is not an issue in most workplaces. However, certain jobs do give cause for concern. Electrostaic discharges in plastics manufacturing are of a real concern due to the potentially extreme voltages which may be found. In one plant, we investigated a 3,000,000 Volt discharge to an operators chest area. It was a 911 call. If that operator had been a pacemaker patient, the outcome of the hospital visit may have been less satisfactory. In one case, a sandblaster worker took an extreme discharge to his head with disasterous results. A pacemaker is implanted just under the skin of a patient with its leads connected to the heart tissue in the atrium are of the heart by little "grappleing hooks" or screws like wires. The pacemaker senses the heart beats and injects a small amount of energy when needed to keep the heart rate at a normal pace. If very high electrostatic discharges are experienced especially in the chest area, the pace maker could be damaged, the leads connections could be affected or the energy of the ESD could cause heart pace problems. 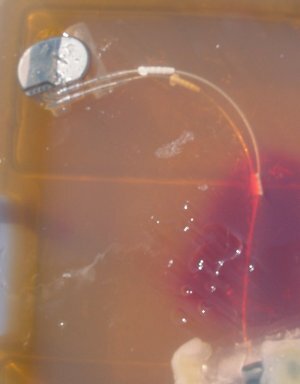 Fowler Associates performed experiments with gellatine phantoms to determine the amount of energy which could be expected in an extreme ESD condition. We found that at 100,000 Volts of ESD to the area of the gelletine just above the pacemaker, the energy we saw through the leads was on the order of 1.4 mJoules at a current of 548 mAmperes. If we scale this up to the 3,000,000 Volt ESD event we investigated, this would give an energy of 42 mJoules at a current of 16.4 Amperes. 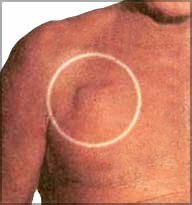 This could be much higher at this extreme potential due to the breakdown of the tissue between the pacemaker and the skin. We believe that the workplace for pacemaker patients returning to work should be surveyed for ESD hazards. Many of these can be mitigated if found to be too high and the worker allowed to return to a safe workplace.